The lead role in the upcoming Fox pilot Prodigal Son has been recast following the show’s initial table read. Iron Fist‘s Finn Jones was set to play the role of criminal psychologist Malcolm Bright, but producers decided to recast the role as a creative decision, according to TVLine. Greg Berlanti is the executive producer on the project. 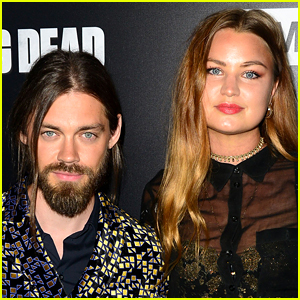 The Walking Dead‘s Tom Payne has announced that he’s engaged to his partner Jennifer Akerman, who is the little sister of actress Malin Akerman! The 35-year-old actor made the announcement about his engagement to the 29-year-old singer/model on the latest episode of Talking Dead after his character, Jesus, was killed off of The Walking Dead. Tom and Jennifer have been dating since 2013. Congratulations! 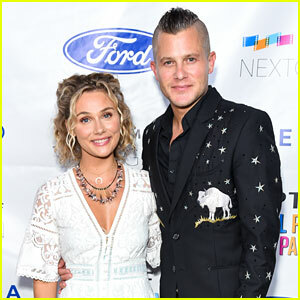 Clare Bowen and her husband Brandon Robert Young pose together at MPTF’s 2018 NextGen Summer Party! The 34-year-old Nashville star and her fellow musical artist stepped out for the event held at Paramount Pictures Studios on Thursday night (August 16) in Hollywood. Clare went barefoot in a lacy white dress, which she paired with an assortment of jewelry, including shell and crescent moon necklaces, and Brandon wore a star-printed blazer with a buffalo on it. A crowd of around 300 people enjoyed a special performance by the duo. Also in attendance were event host and Agents of S.H.I.E.L.D. actor Clark Gregg, Community‘s Yvette Nicole Brown, Property Brothers‘ Drew Scott and wife Linda Phan, The Walking Dead‘s Tom Payne and Emily Kinney, Dietland‘s Joy Nash, Bones‘ Tamara Taylor, and General Hospital‘s Chloe Lanier. The event benefited Motion Picture & Television Fund, which is dedicated to raising awareness and creating impact for MPTF and the entertainment industry community that it serves. 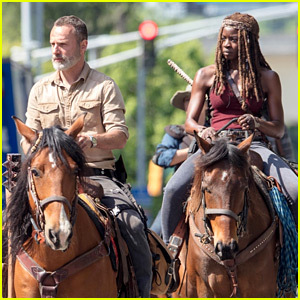 Andrew Lincoln and Danai Gurira ride horses on the set of the upcoming ninth season of The Walking Dead on Thursday afternoon (May 3) in Atlanta, Ga. SPOILER ALERT – The identity of some other cast members on set may contain spoilers, so beware before you continue reading. The actors were joined by their co-stars, including Norman Reedus, Lauren Cohan, Melissa McBride, Ross Marquand, Seth Gilliam, Alanna Masterson, Tom Payne, Sydney Park, Khary Payton, and Pollyanna McIntosh. Production on season nine began this week and it is expected to premiere in late 2018. Jenna Elfman and Maggie Grace strike a pose together while arriving at Fathom Events & AMC’s Survival Sunday: The Walking Dead and Fear The Walking Dead held at the AMC Century City 15 theater on Sunday (April 15) in Century City, Calif. 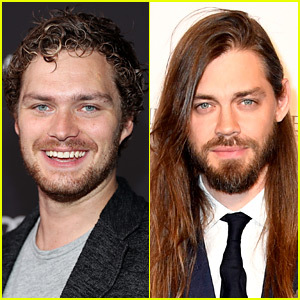 The two ladies were joined at the event by their fellow cast mates Tom Payne, Alanna Masterson, Khary Payton, Josh McDermitt, Seth Gilliam, Kim Dickens, Colman Domingo and Pollyanna McIntosh. 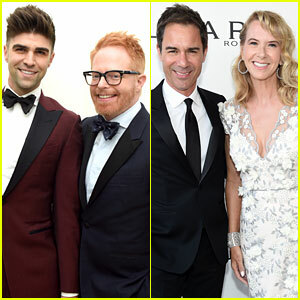 Jesse Tyler Ferguson and Eric McCormack suited up for the 2018 Elton John AIDS Foundation’s Academy Awards Viewing Party! The 42-year-old Modern Family star and the 54-year-old Will & Grace actor teamed up for the event held at The City of West Hollywood Park on Sunday (March 4) in West Hollywood, Calif.
Jesse shared a sweet kiss with his husband Justin Mikita for the cameras, and Eric brought along his wife Janet Holden. They were also joined by Beauty and the Beast‘s Dan Stevens, The Walking Dead‘s Tom Payne, and more. Check out all the fun pics from inside the party in our gallery below! FYI: Tom is wearing Suitsupply tux and Johnston & Murphy shoes.